A simple note on Wormholes and Black Holes. Chapter 1. A survey of popular models. Chapter 2. Some results of Einsteins General Relativity (GR). Chapter 3. A note on the "Schwarzschild radius". Chapter 4. Do we have "Information Loss" at a Black Hole? Chapter 5. How does Superstring Theories match up with a Black Hole? Chapter 6. Planck scale and Wormholes (ER=EPR). Chapter 7. Inflation, and "defects", and Wormholes. Chapter 8. More on the Kerr- and Firewall models. This is a very simple note on Black Holes and (the very "speculative") Wormholes. consider Wormholes as a possible phenomenon in Nature. in some aspects of physics. This means that any talk about Wormholes is purely speculative. This note is a lightweight text on Black Holes and Wormholes. In chapter 1, let's first start with an overview of Black Hole models, and ideas on Wormholes. Next, we will see some results of Einstein's "General Relativity" and how that relates to the "classical"
to Black Holes and Wormholes. I just hope that I managed to present a number of interesting subjects. Although I am very serious here, creating an entertaining note (fun stuff), is actually my main motive. It's very important to state here, that a "Black Hole" might be viewed as a "last- or worst case scenario"
have serious physical interpretation problems. something else, like "Quantum Gravity". where "Planck scale (ER=EPR) Wormholes" have a central role. So I lied a bit above. Sure, quite a few physicists turn their heads away when you start about Wormholes. However, a smaller group of theoretical physicists explore the Planck scale, gravity, quantum mechanics, using wormholes. These folks are really tuned in on a different wavelength. Their studies are pretty neat, really. It must be said that those studies strongly increased in volume, since the last 7 years or so. Let's review some "popular" viewpoints on our two objects. Mabe the first "idea" of a Black hole was concieved by John Michell in 1783, who publicly speculated about a "dark star"
who's gravity was so strong that even light would "fall back". I'am not aware of any older ideas about Wormholes but a paper by Ludwig Flamm in 1916 clearly suggests a wormhole-like entity. His idea was based on the work of Schwartzschild (which work in turn was largely based on Einstein's GR). view the curving as getting asymptotic. Usually, it is percieved that a Black hole "begins" at the Schwartzschild Radius (Horizon), since at that metric, light cannot escape anymore. From a larger distance "outside", SpaceTime is flat. However, as you come nearer and nearer to the Horizon, SpaceTime curves more and more too. the Horizon is much more strechted compared to a similar "piece" of SpaceTime "ds2" at a large distance from the Horizon. At a certain point, very close to the Horizon, even light cannot overcome, or travel, the asymptotically streched SpaceTime no more. Hence, we have a sort of black object in SpaceTime. An important question is: What's "inside" the Horizon....? But there are some considerations too. - charge is / or is not taken into consideration. leads to the most "simple" Black Hole model, "the Schwartzschild singularity". However, it's reasonable to assume that a collapsing mass (which is about to become a black hole), has an angular momentum. A wellknown theory that takes that into account too, is called the "Kerr metric" which leads to the "Kerr Black Hole" model. Let's take a look at some of the proposed Black Hole models, as they exist today. In this case, the Black hole is visualized as a "singularity", that is a point-like entity of infinite density. at which the escape velocity matches the speed of light, so even light cannot escape anymore. First, Einstein's theory of General Relativity (GR) is a piler in physics, but it's not a "theory of everything". For example, Quantum Mechanics (QM) works in the atomic domain and elementary particles, where General Relativity does not work at all. For physicists, it is an enormous challenge to, somehow, unite GR and QM. Up to now, that's still not fully solved. Some say that "Quantum Gravity", once fully matured, or "Superstring Theory", will do the job, one day. all break down at true singularities. This type of Black Hole model, is actually the subject of Chapters 2 and 3.
and a White hole is sort of the reverse: it's an entity where nothing enters into. But, the most viable theory that covers a White hole, then demands that the White hole is a small Big Bang in another Universe. But don't forget: here, we are still only reviewing some popular ideas on our two "objects". 1.1.3. Loop Quantum Gravity "Black holes / White holes". of a black hole into a "true" singularity, and that's appealing to physicists. Due to the high gravity, time "moves" hyper slow. Ultimately, as some physicists say, a "Quantum Bounce"
would change the Black Hole into a White hole, as some of the variants of the Theory predicts. However, we have not observed that yet (probably), since time is almost frozen, extremely close the Black hole. In this particular model, matter that swoops towards the Black Hole, will just "smash" agains the Horizon. and the Horizon (Schwartzschild radius) functions as the unbreakable barrier (the "firewall"). according to GTR, time slows down more and more, when matter comes nearer and nearer to the Black Hole. compared to an observer that rides along the falling matter. As a collary, it is generally assumed that the 'surface' "A" increases over time. The Firewall model is not without inconsistencies. However, that statements holds for any model. so victimized matter has not other degree of freedom than to radiate towards the Firewall again. which is the physical placeholder for victimized matter and information. three spatial dimensions, and one time dimension, also often referred to as a "(3+1)". As you probably know, theories exists using additional dimensions, which often are assumed to be compactified. but it goes undetected anyway, since only "gravity" is "aware" of it. Applied to Black Holes, the topology might differ from the usual "spherical model" (chracterized by the Schwartzschild Radius). In particular, donut shaped "Black Rings" seem to be possible. using Entropy considerations as an important tool to explore further. This then results in the "Fuzzball" Theory, where the interior has a certain size, and thus avoids the singularity. Furthermore, string and Branes preserve the "states" of the matter that was victimized, and thus it avoids the "Information loss" problem. It seems from the literature, that many view this model as a very good cadidate. See chapter 5 for more information. a singularity might be expected. However, that conflicts with other pilers of physics like Quantum Mechanics. It's fair to say that current theories does not fully solve the Black Hole problem. However, when angular momentum (rotation) is taken into account too, different solutions may pop up. and then starts to spin faster and faster. be ring-shaped too. This is often called the Kerr Black hole, or the Kerr Ring. The recent movie "Interstellar" gave a new impulse to this idea, and I like to present some more information in chapter 8. By now, we have seen a few common idea's about Black holes. We will see some of those ideas again in the following chapters. Let's next see about Wormholes. is rather hypothetical (or speculative). like Wormhole types with names as "the Schwartzschild-", and "Einstein-Rosen" bridges. Wormhole-like structures links multiple Universa. of a sort of foam of wormholes. It's a serious idea, under study by a few physicists. Interestingly, the latest "models" link those sort of wormholes to the Quantum Mechanical feature "Entanglement". It is certainly not so that everyone supports a classification as shown above. However, most scientists in general, seem to have ideas's on one of these directions. A "subclassification" exists, in the sense of a "traversable" or "non-traversable" Wormhole. if it would be possible to send any kind of signal through such a Wormhole. know so well from SF literature- and movies. then light (or Electromagnetic radiation in general), if it takes a conventional path, will take 2000 years to travel from "A" to "B". the Wormhole might be anything from almost instantaneous, to any other unknown length of time. So, this wormhole acts much like a tunnel, with two ends, each in separate regions in spacetime. that for now it it is difficult to see how a Wormhole could be used for something like interstellar travel. But it's fun to speculate and read SF ofcourse. In general, it is believed that "negative" energy, will lead to "negative" pressure (expansion) on SpaceTime. mixed them up, and I don't see the precise "naming" as very critical for our simplified discussion. quantum fluctuations on the Planck scale is believed to produce a "foam" of "+" and "-" spikes. But, a relation to the macroscopic world is not easy to make, yet. Where: ä is SpaceTime expansion, p is "pressure" and ρ is the density. at least some theoretical basis. Other arguments lead to the perspective that a Wormhole might connect different Universes. Yes..., that's something else indeed. Above, in section 1.1.2, we already have seen a certain interpretation of this: The Black hole/White hole pair. private Big Bang and possibly evolved to universa with their own vacuum states and different laws of physics. As we shall see later on, arguments are possible as to why a wormhole might be a bridge between such manifolds. the inflationary model, so that it does. for the theory. It cannot be ruled out that "interactions" between those Branes, might exist. Next, a few words about the "Planck Scale" Wormholes. A very intruiging type are the hypothetical and "nihil sized" wormholes operating at the "Planck length". This metric is so extremely small, and it is supposed to be the lower limit in scaling down the spacetime fabric. When we would zoom in the Vacuum, to the most extreme lowest scale possible, the "Vacuum Foam" might be noticable. uncertainty in Energy and Time, at this scale, might be the underlying source for the "vacuum fluctuations" like virtual particles. Some recent theoretical studies, even associate those Planck scale wormholes to "entanglement". That will be further explained (or "touched") in chapter 6.
intelligent, and very involved in physics. So, what Einstein wrote down, is absolutely not "easy", so to speak. Above we see (just) one of Einstein's "field equations" of his famous "Theory of General Relativity (GR)". In GR, gravity has curvature effects on the four dimensions of the SpaceTime. So, a large mass, will noticeably curve SpaceTime. What the equation says, is actually how much curvature there is in any given region of space, due to "mass" in the vincinity. The part on the left side of the "=" sign ( Guv ), is a measure for the curvature of SpaceTime. The part on the right side of the "=" sign ( Τuv ), is a measure of the amount, or density, of "mass" (or read "mass-energy"). So, the "amount" of curvature of SpaceTime is directly related to the mass. Indeed, it's directly related, so: a small mass means a low curvature, and a high mass means a high curvature. Guv is the "Einstein tensor" and Τuv is the stress–energy (related to mass) tensor. Let's clarify those tensors a bit. Einsteind solved the problem of gravity in geometrical way, using manifolds and tensors. For example, a simple number, a scalar, can be used describe some physical properties like Temperature. The temperature somewhere in a room, can be expressed by a simple number, a magnitude only (there is no further geometry). at a certain point in space. Also, velocity has a magnitude and direction too. at any point inside, countless stress points exists, with different magnitudes and directions. You can use a sort of "stress" tensor to describe the material in such a situation. and you cannot use a scalar, or vector, to describe that. Here, an mathematical extension, a "tensor", does the job. A tensor can often be used to describe "Operators" (or mappings) too. Often you can write it as a "matrix". can be described by Guv, all due to the "cause", which is the Τuv tensor that decribes the mass-energy distribution. Actually, this is just (!) one of the many, many milestones, by Einstein, already developed in (around) 1915. The equation above, also says something fundamentally (in a classical way) about Black holes (and the hypothetical Wormholes). the point where the "strech" goes to infinity. Or in other words, "ds" as the distance metric, becomes asymptotic. In case of a Black hole, nothing can escape anymore, not even light (in the GR framework). Whenever a theory allow for a true singularity, physicists walk on their toes. something else, like "Quantum Gravity" (in fact, physicsts try to unify or reconcile, the different theories). Chapter 3. 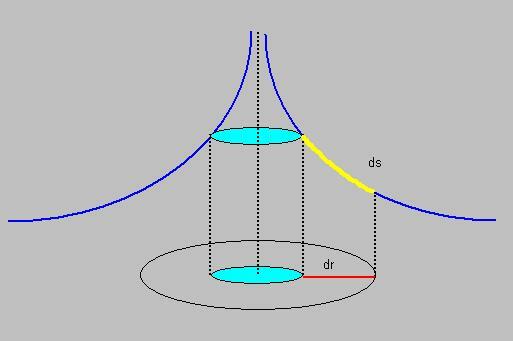 A note on the "Schwarzschild distance" (or radius). In chapter 1, we saw that if the "mass-density" would be very high, then the surrounding SpaceTime get's strongly curved too. In the extreme, space would be streched so much, and gravity would be so high, that even light would not escape anymore. This sort of "barrier" (where even light would not escape anymore), is also called a "horizon". from "Earth" would be the speed of light (c). In that case, the "horizon" would be 9 mm. If you would do the same for the Sun, you need to compress all mass into a sphere of less than 3 km. Karl Schwartzschild calculated a "horizon" for any mass ("M") compressed inside a critical radius rs. So, the "horizon" and "critical radius" is the same, actually. This critical radius is called the "Schwarzschild radius". The full "exercise" is also called the "Schwarzschild solution". When you, from the "outside", would move towards that radius, the curvature of spacetime increases, and the gravity strongly increases too. At the Schwarzschild radius, the gravity is so strong that even light cannot escape anymore. anything beyond that horizon. Essentially, it's a "black hole". Why? Because light cannot escape anymore from within that horizon. nothing can escape, not even light. So, Schwartzschild went to work, armed with the insights produced by Einstein. We have some mass concentration at some location, but no there is no other "stuff" elsewhere (outside the horizon), like another large mass. The system under observation is Spherically symmetric and "time independent". Most derivations uses "spherical coordinates" (r,θ,φ) instead of (x,y,z,t). There is no angular momentum (of the mass) involved. That would complicate the derivation. The "Λ" is assumed to be zero. The solution is valid for outside the "Horizon" only. We just have some steady mass inside some region, which does not grows bigger or gets smaller in time. the heavens, or sea going folks use positions of stars to determine their location, it's just "natural" to use (r,θ,φ). Don't you agree that this coordinate system fully describe any postion around the horizon? You only need a radial distance "r", and two angles, to fully qualify any position in the space surrounding the mass. However, if we "stay" in one plane only, we can eliminate one angle. (1): We must also keep in mind, that at a great distance from the Horizon, the curvature is small or even going to flat space again. Only when you get nearer and nearer towards the "Schwarzschild radius", the curvature gets larger and larger. (2): Actually the same as (1), but we intuitively feel that the spacetime curvature should be dependent on "r". So, instead of studying all points in space around M (then we indeed need r,θ,φ), we just take an imaginary "plane"
where φ is zero. We can still calculate the curvature, but then limited from this "plane" only. However, that's good enough. There is no need to reproduce the full "derivation" here. I will only show some formula's that were essential in his reasoning. I am afraid that a full derivation would be utmost boring. So, we will not do that, and it's not neccessary at all! We "trust" Schwartzschild, and the relation below is facinating. I will explain why it's "great", in a moment. Now, take a look at figure 1 below. How to interpret figure 1? Below in figure 1, you see some concentric circles, representing flat space, so, in this case, there is NO mass M in place. You see a piece of lenght, called "dr". In fact, in this situation, just think of it as if those blue curved lines are not present in the figure. is now expressed by the "blue" curved lines. The closer you go to the centre, the more asymptotically the blue lines become. the piece of lenght, is now represented by "ds". Note that now "ds" is longer than "dr", but actually is should be the same piece of space. the length without the mass M (dr), and the length with the mass M (ds). Where "G" is the gravitational constant, "c" is the speed of light, and "M" is the mass inside the critical radius. then it's a black hole. a practical solution for a common situation. Ok, now we have a little insight in the "critical" Schwartzschild Radius too. open questions and paradoxes. And this subject is "just" one of those open questions. For this specific issue, is there really a problem? It depends a bit on your viewpoints. I have noticed that some physicists don't see much of an issue, while most others do. It's not exactly a question for an IT expert. It is a problem in physics, and probably an interesting one for Philosophy too. There are two scenario's people speak of. Let's see about them. For the first time, we have a true and brutal "sink" in SpaceTime, which "slurps up" everything. Anything falling in, has a certain "state" (a Quantum State if you will), which gets suddenly (?) lost if it enters the Black Hole. If you like, you can take an example of an Quantum entangled system. Suppose one particle of the system flies into the Black Hole. What happens with the state of the other free particle? Or what happens to both? From ElectroMagnetic-, ThermoDynamic-, Nuclear-, Quantum Mechanical standpoints, there is some worries about "Information Loss". However, it seems that the more "deterministic" elements enters some theory, the worries gets bigger and bigger. For example, does the present state of a system determines the former and/or future states? as a possible demolisher of encoded information. The "Information Loss" problem is felt to be extra painful if a "singularity" is involved. Matter (and thus some sort of information) falls in the "singularity", and nothing changes over there? then that's tough to digest for physicists. while matter falls in, information "might" not be lost. In a way, states are collected in "some" manner. Stephen Hawking proposed that a Black Hole "radiates", due to a special effect. and live for a very short time, before they annihilate each other, producing a photon. as long as the timespan is short enough. such as the "Casimir effect", or the "Zeemann effect" etc..
Now, when virtual particles are produced near the "critical Schwartzschild Radius", one particle may get "lost"
into the Black hole, while the other one "gets real" and escapes. This just have to have impact on the Black hole, whether it be small or large, but it simply has to. This one partner that goes into the Black hole must be "negative" Energy, since the one that escapes becomes real, and is positive. Yes, the particle that survives is "normal", so has mass and thus Energy. In other words, suppose a Black hole is on a diet, and does not "eat" matter any further, it will slowly "evaporate". Now, there remains the question if "Hawking radiation" possibly solves the Information loss. and one partner goes in, and the other partner escapes. It is supposed that it contributes to "evaporation" of the Black Hole. Here then lies the crux of the Information Loss problem (of scenario 2). Structured matter falls into the Black Hole. However, if it should evaporate, the structured matter would be gone forever. So, what happens to the information stored in the black hole if the black hole completely evaporates? Note 1: At what point does something enters the Black Hole? changes quickly too. It's runs slower and slower (according to "pure" General Relativity). something substantial about Information Loss. And if space gets curved asymptotically, what happens with a "state"? as was discussed in chapter 2. However, slow time begins to have effect before that point. Virtual particles is the reason why (hypothetical) microscopic Black Holes will evaporate very quickly. because the Vacuum is everywhere. Note 3: Other ways how a Black Hole might radiate? interior of the Black hole, thereby also preserving the states of all the matter that fell into it. The theory avoids a singularity alltogether, and thus it sounds quite promising. of the Black Hole's horizon, might be coupled to the absorbed states of all the victimized matter sofar. In that case, the states are probably "not lost", since the Surface Area sort of "describes" all the states. It's an interesting idea ofcourse. However, probably just not firm enough yet, to be a leading theory in the field. Sure, this chapter is hopelessly incomplete, but this subject is not my main mission. So, what's the score at this point? Nobody is certain (as espected), or can really proof something. However, the "Fuzzball Theory" seems promising. Chapter 5. How does Superstring Theories match up with a Black Hole? The Fuzzball? I think that string physicists, deep into the matter, really grasp what it is about. Ofcourse, many have a good idea, however, the math is so steep, that it prevents most of us (like me) to get the "nitty gritty" stuff. Origininally, the (9+1) "Superstrings Theories" were unified into the (10+1) dimensional "M-Theory". a certain number of supporters, but I am not sure how "popular" this theory really is among string physicists. It seems to be a (10+2) Theory, but it should not "exactly" be interpreted as having 2 time dimensions. No doubt that all the Superstring theories are extremely "spicy" for simple mortals like me. In Superstring Theory / M-Theory, elementary particles are "strings" on a extremely small scale. and is very appealing to physicists. while an "entity" as the graviton (force carrier of gravity) is believed to be a closed string. they go completely undetected indeed. a generalization of a "string". However, in many papers a brane is visualized as a "manifold" or space-like object. but contrary, the graviton might be "aware" of it. As we have seen in chapter 4, a signularity Black Hole, is difficult to reconsile with information states. Matter falls into the "black hole", while the Singularity does not change (it is a Singularity). So, a lot of folks see a paradox here: "Information loss". In the view of many, thus two things were not "ok": (1) the singularity itself, and (2) the paradox of "Information Loss". A rather nice solution to both problems is the "Fuzzball" Black hole. - First, it avoids a singularity, since the fuzzball is some region in space. - Secondly, it probably cures the "Information Loss" paradox. The Fuzzball theory was firstly published by Samir Mathur and his co workers. Fig 2. 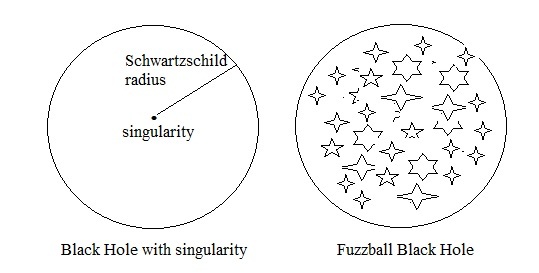 Traditional "singularity" compared to the Fuzzball. is so large, that even light cannot escape anymore. In Superstring theories, particles are strings in a (10+1) space, from which a number of spatial dimensions are compactified. The vibration of the strings goes in all spatial dimensions. When matter falls into the Black Hole, the new strings fuse with other strings, forming complex strings or branes. In the formalism, it is shown that this type of Black Hole is not infinite "dense". It's quite dense ofcourse, but not extremely. which looks like a real plus for this theory. the Black Hole. Furthermore, this horizon is not strictly defined, but is "fuzzy", meaning that interactions with fields "just outside"
the horizon might happen, which counteracts the "Information loss" problem too. In the model, the Black Hole's "fuzzy" horizon thus radiates (some?) Information back to the Universe. Chapter 6. A note on the Planck scale and Wormholes. due to large fluctuations (or Quantum Mechanical "uncertainties"), at, or around, the Planck length? that quantum uncertainties truly exist at the smallest scales of SpaceTime. So, from such a viewpoint, further theoretical investigations are certainly justified. Indeed, quite recently, say the last 10 years or so, a revival took place leading to many publications. can be used to explain the existence of Planck-scale Wormholes. as a part of the Hawking radiation process (quanta goes "in", related quanta "escapes"). Remember, when virtual particles are produced near the "critical Schwartzschild Radius", one particle may get "lost"
Stated in other words, but it's actually the same, is when you look at from a "quantum fluctuations" viewpoint. that negative energy is required for producing a wormhole). the "Planck mass", at which point precisely, the Black Hole's Horizon matches the "throat" of the "internal" Wormhole. What then might result, is a singularity which is shielded by the Wormhole's throat. In upper article, mathematics is in place that support this proposition. By the way, shielding of a Singularity in general, might be some sort of requirement of Nature. Actually, any Black Hole (like the "large" regular ones, indeed do have a Horizon/Schwartzschild radius). a "Wormhole Factory", since negative energy-quanta's will frequently meet the micro black hole. ER stands for "Einstein-Rosen" bridge (a type of intra-universe Wormhole: see section 1.2). expressed doubt on the completeness of Quantum Mechanics (sort of). are intertwined in such a way, that the wavefunction (or state vector) cannot be written as a product state. It means that you need both particles to write down the state of an observable. on one particle, seems to have an instanteneous effect on the outcome of a similar measurement of the other particle. This has puzzled the scientific community for a long time, and it still does. proposed that Entanglement actually is due to entanglemstsc d black hole pairs at opposite ends of an ER bridge. Those two black hole pairs are actually the endpoints of a Planck-scale quantum wormhole. to support the core claim above. Chapter 7. Inflation and "defects" and Wormholes. Chapter 8. The Kerr Black Hole, the Firewall model, and others. Largely due to the movie "Interstellar", let's try to find some simple words to describe Kerr systems.